End Is Nigh For Over-The-Counter Inhalers That Eat The Ozone Layer : Shots - Health News The epinephrine inhalers, marketed as Primatene Mist, are one of the last consumer products with chloroflouorocarbons, or CFCs, to disappear from the market. Primatene Mist, a nonprescription inhaler, will no longer be available after December 31, 2011 because it contains chemicals that harm the environment. People with asthma who've been relying on cheap, over-the-counter inhalers to get a soothing blast will have to look elsewhere for relief beginning in 2012. The U.S. Food and Drug Administration said Thursday that epinephrine inhalers will not be made or sold after Dec. 31, 2011 because they rely on chloroflouorocarbons, or CFCs, to propel the drug into the lungs. There's currently only one company — Armstrong Pharmaceutical Inc. — that sells the inhalers, which are marketed as Primatene Mist. CFCs are refrigerants that erode the ozone layer, and environmental groups have been working since 1987 to phase them out under the Montreal Protocol on Substances that Deplete the Ozone Layer. The epinephrine inhalers are one of the last consumer products with CFCs to disappear from the market. The amount of CFCs in a tiny inhaler might not seem like a lot, but protecting every inch of the remaining ozone layer is critical for health and the environment. Not only does the gaping hole in the ozone layer contribute to the warming of the planet, but it also allows more dangerous ultraviolent radiation into the Earth's atmosphere, contributing to skin cancer. 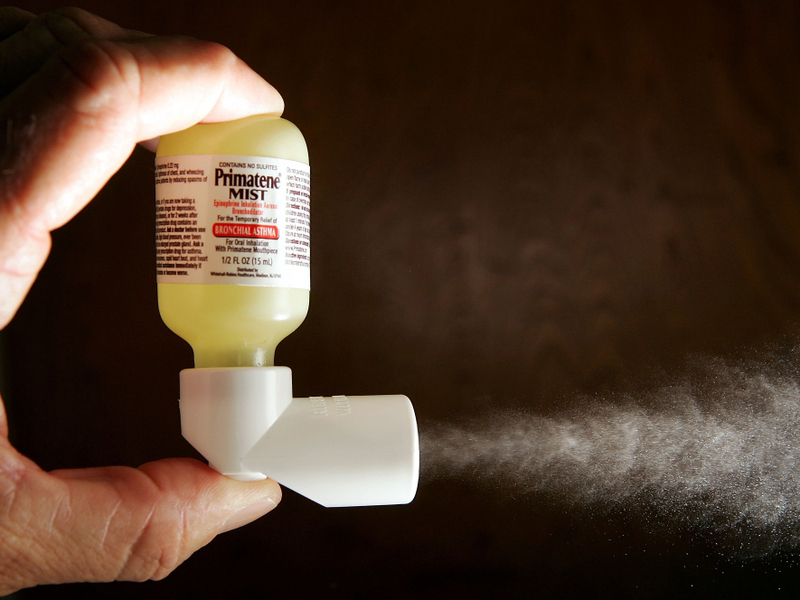 The coming ban on Primatene Mist may not come as news to most inhaler users, since the FDA has been talking about the phase out since 2008. The company has also had a warning label on the product about the impending phase out. And many consumers have already switched to albuterol hydrofluoroalkane, or HFA, inhalers. They're more expensive, but far kinder to the environment. And inhalers aren't the only option for people with asthma. As Shots reported earlier this year, researchers in England argue that drugs called leukotriene modifiers, which come in pill form, are reasonable alternatives to the plastic tube.